Successfully Added Bluetooth Headphones - Connects To Two Devices At Once, Bluetooth 4.2, Supports Android And iOS, 10m Bluetooth Range, 220mAh to your Shopping Cart. Conveniently listen to your favorite tracks anywhere you’re at with these high-end Bluetooth headphones. 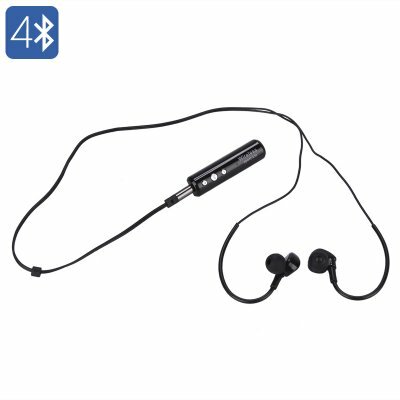 By supporting Bluetooth 4.2, these earphones can be easily paired with up to two iOS and Android smartphones or tablets at once. You’ll be treated to fast transmission speeds and a lag-free audio experience. This allows you to enjoy an outstanding audio-experience at any given moment. With its ear hook design and different sized earplugs, this wireless Bluetooth headset guarantees a comfortable for anybody out there. By packing a miniature yet powerful 220mAh battery, these earphones allow you to listen to songs for up to 7 hours straight. Whenever you’re running low on juice, you can simply recharge your Bluetooth headphones via the included Micro USB cable. With a 10m Bluetooth range, these wireless earphones bring along great mobility. Whether you use them to watch a movie without disturbing others or to listen to those all-time classics while taking a walk outside – these beautiful Bluetooth earphones are sure to meet your demand. These Bluetooth headphones comes with a 12 months warranty, brought to you by the leader in electronic devices as well as wholesale electronic gadgets..